Basic black is the undisputed foundation of fashion, but how about cosmetics? I love charcoal products! Specifically I love the texture, the scent and, yes, the colour. Due to its porous structure, charcoal absorbs oily particles and the mild grittiness makes it good for smoothing skin. In Asia, it's bamboo charcoal (竹炭) that is used in beauty products. 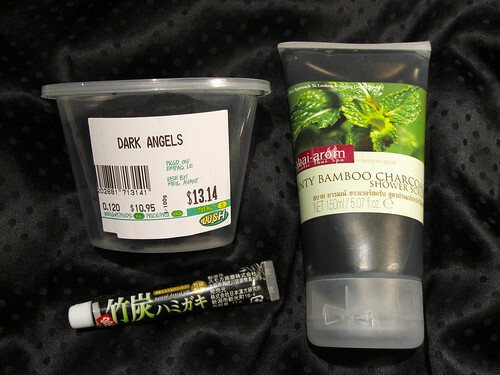 Above, there's the Dark Angels facial scrub from Lush, one of a few charcoal items available in their obnoxiously perfumed stores. Also, I use a mint bamboo charcoal scrub from the rather lovely Sabai Arom line of Thai spa products sold at Boots in Thailand. Finally, I have a precious little tube of "natural" bamboo charcoal toothpaste from Japan. I don't rely on it everyday but black toothpaste certainly isn't a new concept. I bought quite a few charcoal facial masks and soap bars when I was living in Japan. I'd just look for that '竹炭' kanji on the packaging! In Australia, there's a charcoal mask and soap available from Young Solution. I like what they say about their charcoal products: "you gotta get dirty before you can come clean!"